Whilst I was taking the teenager and toddler to their nana’s for the day so I could go the kid free place called work, (woo hoo!) Bon Jovi’s Livin’ on a Prayer came on the radio. It is almost impossible not to sing really loudly to this and much to the teenager’s disdain, I did! All the way to nana’s. When it had finished, I told the teenager that I had danced to that particular song at the school leavers disco, many moons ago. Twenty one actually, God do I feel old now! The teenager obviously being too cool, just rolled her eyes and laughed. But it got me thinking though about when I was sixteen again. I was one of those who hadn’t got a clue what I wanted to do now school was finished. There were plenty of those around me that were going to be a doctor, vet, teacher, lawyer etc. But I hadn’t a clue! I met hubby not long after I left school. He was working and I decided I wanted to as well. (What was I thinking?) College went out of the window and the working world came into view! Now twenty-one years later, two kids, mortgage and hubby and I still working, I am ready to go back to college! Well, distance learning anyway. To anyone who has read my blog before, you will know that recently I was undecided about going back to study. Well, I am going to take the plunge and sign up for a course with the Open University that starts in November!!!! Cue fanfare!!! I love the 1940’s era. The hair, the clothes and the music. From Glenn Miller’s Moonlight Serenade to victory rolls. I do love it all. Sometimes I have even ventured out of the house in my non vintage reproduction tea dress with my hair in curls and flower pinned over one ear. The last time I did this three people I didn’t know commented (thankfully complimentary) on the way I looked. It was fantastic. It has been ages though since I have dressed up because I am quite self conscious about it. 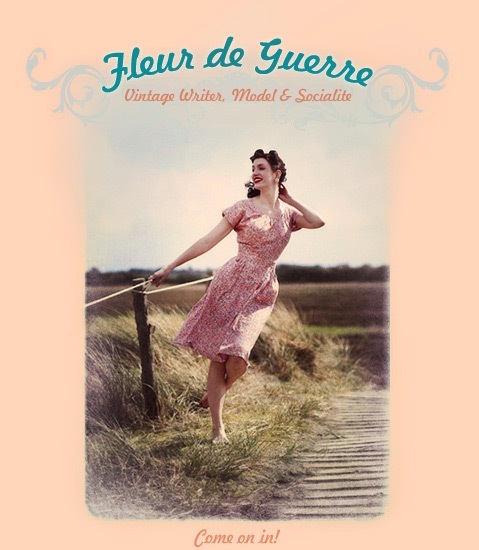 I recently read a post from my favourite vintage blogger Fleur de Geurre, called Going Against the Flow. Fleur explains how she got into vintage and experimented with different sorts of fashion and hairstyles over the years from punk to dreadlocks to heavy metal. The she came across the forties era and never looked back. It instilled a confidence in her that she had lacked as a child. Fleur then goes on to suggest how vintage newbies can tap into this confidence. It can be from buying your first repro dress or wearing a pillar box red lipstick. Just a small change can set you on your way to being confident and comfortable in your vintage gear. I think I will definitely try and be more vintage in future. Last week, the family and I headed off to Cornwall for a weeks holiday. The weather prior to going had been particularly shocking and a bit of a wash out so a variety of clothing had made its way into the suitcases. The journey down the motorway passed without incident and after a brief downpour whilst driving through Devon, the sun came out just before we reached Newquay in Cornwall. 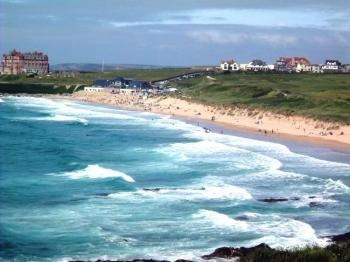 We decided to stop at Fistral Beach in Newquay, a mecca for surfers and beach dwellers alike. 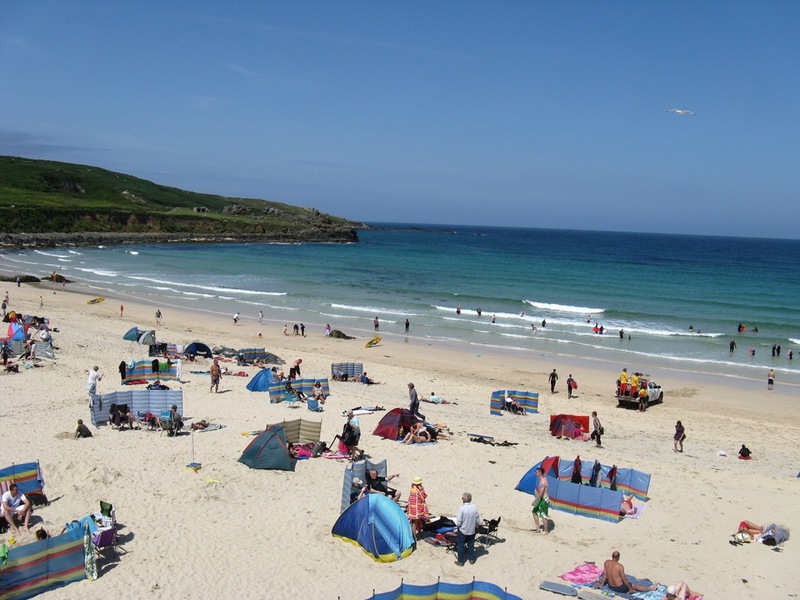 Fistral is a fabulous place with numerous surfy clothing shops, cafes and a traditional bucket and spade emporium, all of which overlook the sweeping bay of soft golden sand coupled with huge rolling waves. As delightful as Fistral was, it was only a brief sojourn until we reached our final destination. About an hour after leaving Fistral, we reached our home from home for the week. 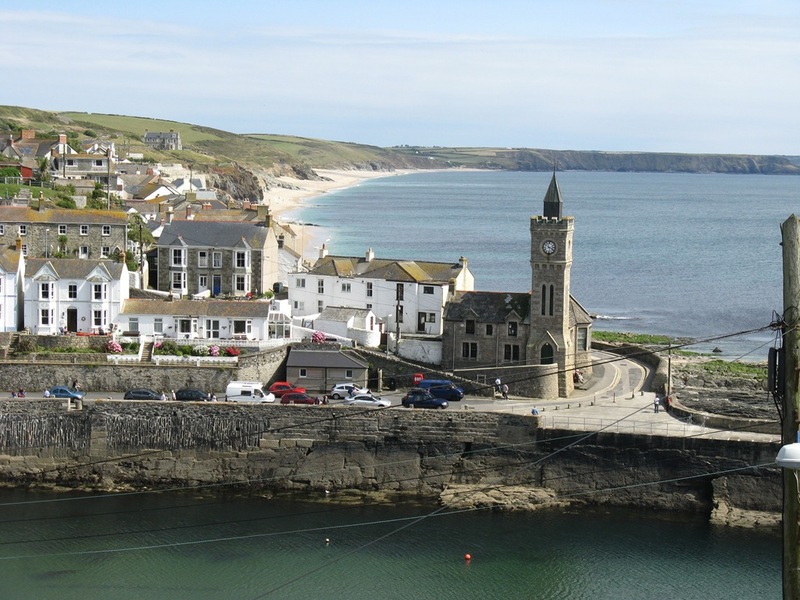 Porthleven in west Cornwall. What an absolute gem of a place! Not so big to be full of the summer crowds and not too small to be able to walk round it in ten minutes. There were cafe’s offering cream teas (yum), pubs, an art gallery, a fantastic deli, restaurants tempting freshly caught mussels, boutiques…. What more do you need? The Church stood at the end of the harbour wall and just behind it the dramatic coastline was a wonder to behold. You could see all the beaches and coves all the way down to Lizard point, the most southerly point of the British Isles. The cottage delivered on every front too. 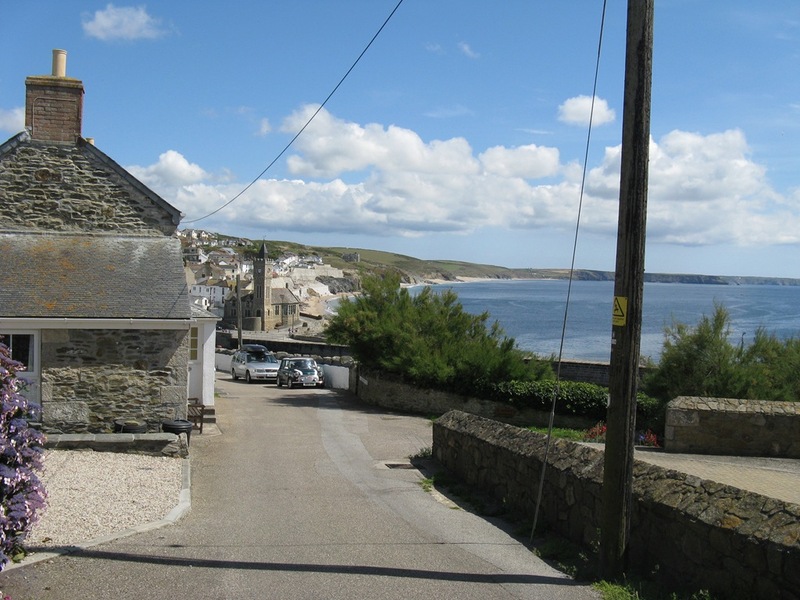 It stood on top of a hill with views of the church, harbour wall and the beaches beyond. 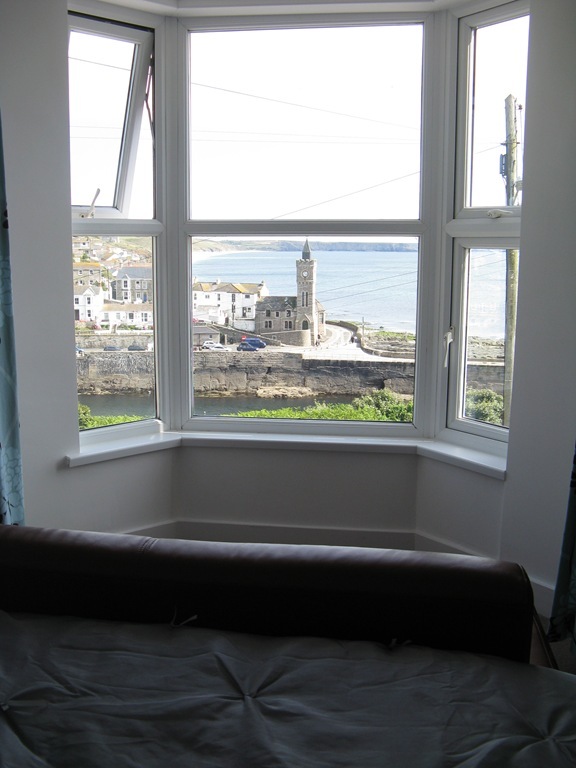 In the master bedroom, there was a settee at the foot of the bed so you could sit and take in the view. The weather God was on our side that week, with blisteringly hot days almost every day! We didn’t really go too far, preferring to laze away on the beach but we did go and have a look at St. Ives (another fabulous place but extremely busy), Falmouth and St. Michaels Mount*. 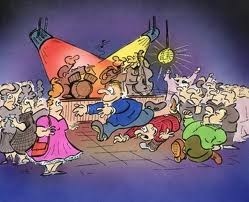 In all, we had a fabulous time! 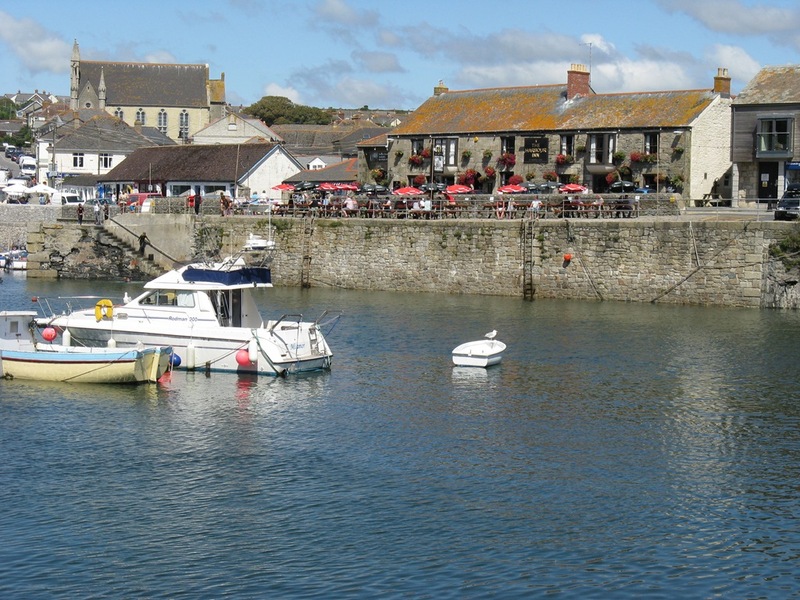 * A funny thing happened when we went to St Michaels Mount in Penzance. 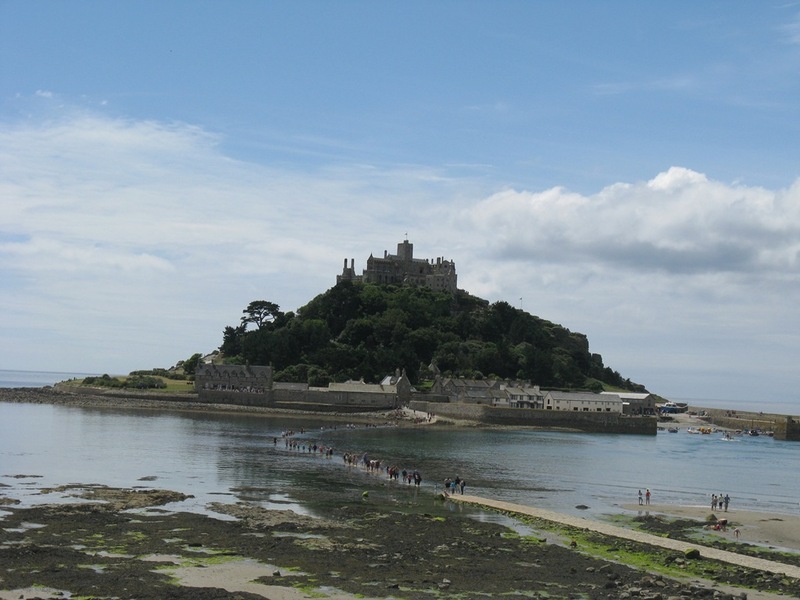 St. Michaels Mount is a castle- topped isle in Mounts Bay. It is accessed by a long causeway from the beach to the island, that at low tide is easily accessible. When the tide is high, there are boats that go back and forth to ferry the tourists. When we walked over the causeway, the tide was well out and we only saw the odd rock pool as we approached the island. We had had about an hour or so looking around when hubby overheard someone say that the tide was coming in. We moved quickly to the causeway, which was full of people walking in both directions. As we started walking, it became quite obvious that we were going to get our feet wet! Luckily, teenager, toddler and I had shorts and beach shoes on. Hubby on the other hand had jeans, socks and trainers! Well laugh, I nearly cried! Teenager sauntered back along without a care in the world, toddler wanted to sit in the water and hubby ploughed through the water with an empty pushchair at about a hundred miles an hour! When we eventually caught up with him on the beach, it would be safe to say that he was soaked through up to mid calf! Well we did have a laugh, (hubby did not!). As we walked off the beach, we spotted a lovely hotel overlooking St. Michaels Mount offering cream teas (yum). We decided to stop (I took no persuading!) and make the most of our last day (hubby put on a brave face!). Whilst hubby took some pictures of the island, he noticed some people were still crossing the causeway and the water was up to their thighs! I’m sure they must have been saying “what the hell, I’m on holiday!” Spoken like a true Brit! This was taken at Praa Sands! 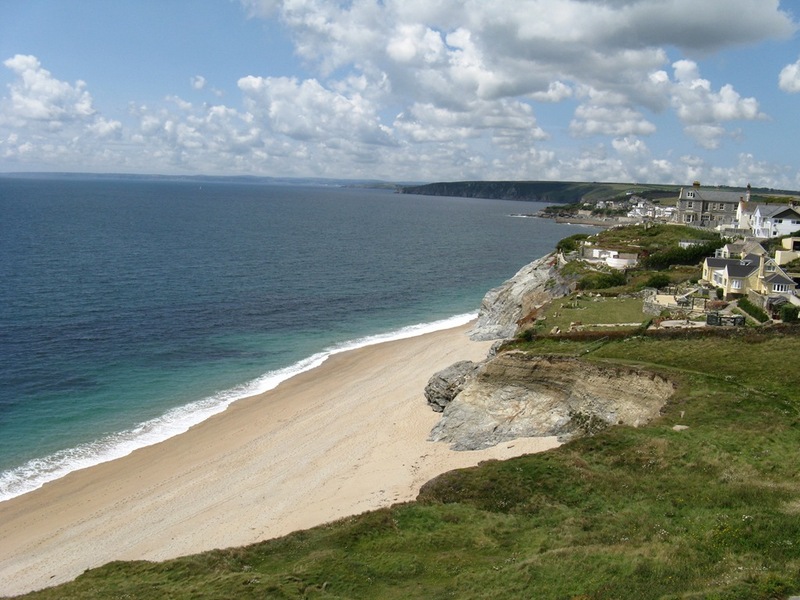 And this one is one of the beaches behind the church in Porthleven! On the piccies front, all these except the top one at Fistral were taken by hubby!